The invention of agriculture was a pivotal event in human history. The first animal tamed by people was the dog. Its domestication probably occurred in the Early Stone Age, in the period of hunting development. Centuries later, people managed to tame sheep, pigs, goats, and cows. The Armenian Highlands are crucial in this regard. 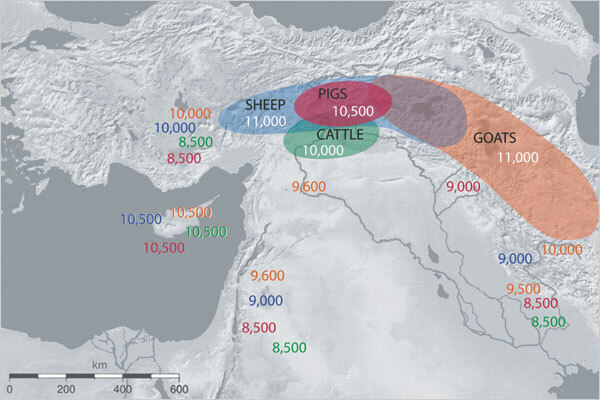 The oldest center of stock farming can be traced to the Armenian plateau. In a paper: “Domestication and early agriculture in the Mediterranean Basin: Origins, diffusion, and impact” Dr. Melinda A. Zeder (2008) argues that the early spread of agriculture known as the Neolithic revolution spread from the Armenian plateau through a mix of colonization and cultural diffusion, into Europe and elsewhere. Dr. Zeder believes that in Europe the indigenous hunter gatherers adopted the new farming technologies by cultural diffusion. The map, from the article in the August 11 2008 issue of the Proceedings of the National Academy of Sciences, shows the regions and dates where the four species were first domesticated. 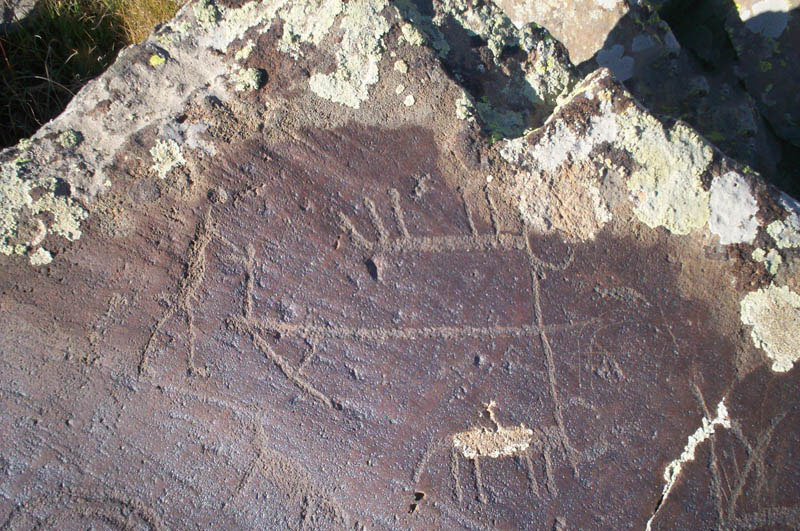 On the slopes of volcanic massifs of Armenia, 3000 meters above sea level, one can find whole galleries of rock drawings of agricultural motives. 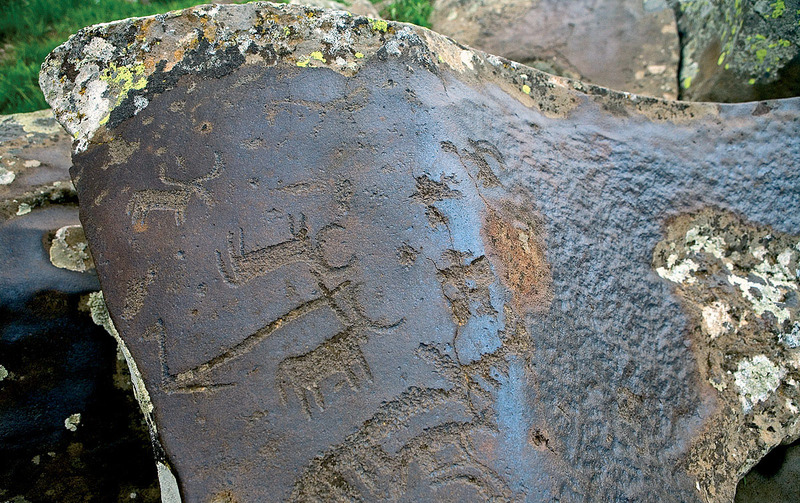 Some of these petroglyphs are dated as far as the 12th -11th millennium BC. The population of the Armenian plateau was among the first to domesticate animals. One of the most significant reforms in the history of mankind made comprehensive changes in the economic life of the society and exerted immediate influence on the formation of new mythology and systems of chronology. The first farmers depicted the great history of agronomics in petroglyphic drawings. The symmetric arrangement of predominantly zoomorphic heroes was an indispensable attribute of the new times. The harnessed bulls, for instance, represented not only the process of tillage, but also the mystery of fertilization. This explains the presence of the most important element in the drawing, which is the central cruciform axis bearing a certain religious meaning. 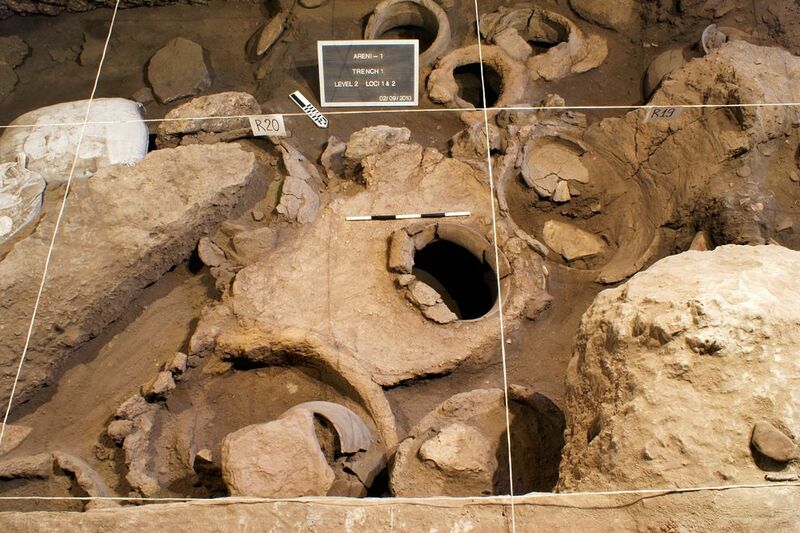 6,100 year old Wine making press (oldest known) discovered in Armenian Cave. The discovery is important because wine-making is seen as a significant social and technological innovation among prehistoric societies. Vine growing, for instance, heralded the emergence of new, sophisticated forms of agriculture. As domesticated vines yield much more fruit than wild varieties, larger facilities would have been needed to process the grapes. The discovery that wine-making using domesticated grapevines emerged in Armenia corroborates with previous DNA studies of cultivated grape varieties, McGovern said. Those studies had pointed to the mountains of Armenia, and neighboring countries as the birthplace of viticulture. From a social perspective, alcoholic beverages change the way we interact with each other in society, often facilitating supernatural believes and religious practices. Agriculture allowed for the support of an increased population, leading to larger societies and eventually the development of cities. It also created the need for greater organization of political power (and the creation of social stratification), as decisions had to be made regarding labor and harvest allocation and access rights to water and land. Agriculture bred immobility, as populations settled down for long periods of time, which led to the accumulation of material goods and creation of a common culture, that was able to spread with advances of technology.